How much do I love spices? I own a board game called Spices of the World, have a well-thumbed copy of The Complete Book of Spices on my cookbook shelf, and it’s widely known that cumin is my all-time favorite spice. But this month, I’m abstaining from my lovely, aromatic friends while I give the autoimmune protocol (AIP) a shot. I don’t think I have an underlying sensitivity to spices that’s holding me back, but n=1 and all that. 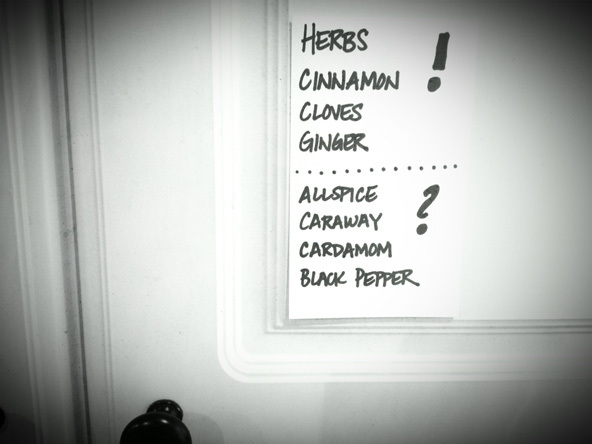 In case you don’t want to make an index card sign for your kitchen cabinet (although it’s all the rage this season), here’s a quick way to remember which seasonings are approved for the AIP: herbs are 100% go and seed spices are verboten. 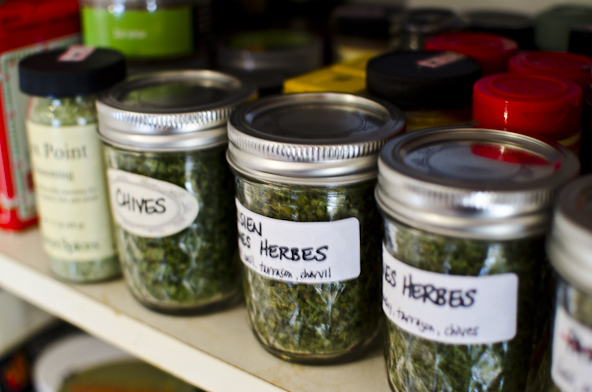 So what’s the difference between herbs and spices? Both herbs and spices originate as plants and are used to flavor foods, but there are distinct differences, and those differences become essential to understand when someone tries to make your life miserable help you get to the root of your fat-loss issues by suggesting you follow the autoimmune protocol. My bottom line: The Fines Herbes and Bonnes Herbes are very similar, and I slightly prefer Fines Herbes because I don’t love basil and dill on raw veg. But that’s a quibble; you can use them interchangeably and probably don’t need both. Use Bouquet Garni on roast meat, and use Fines Herbes/Bonnes Herbes for the veggies on the side. Tasty on: everything! but especially sautéed broccoli, Brussels sprouts, cauliflower, and cabbage… and sweet spuds! 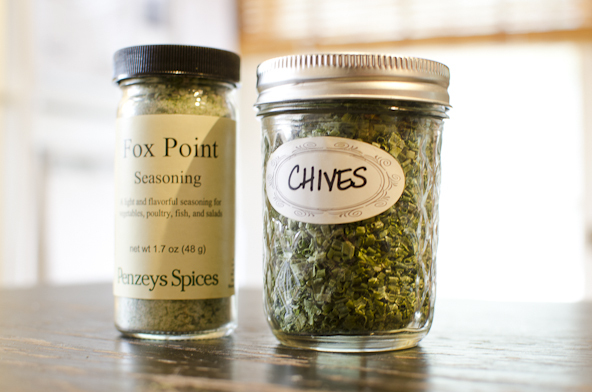 My bottom line: Anything with chives rules. The end. Flavor profile: makes everything taste pizza-ish. YAY! My bottom line: I like having both, even though they’re quite similar, just because then I can alternate. My bottom line: By combining cinnamon and mint with garlic and salt, I can whip up quasi-Middle Eastern meatballs. Life is good. 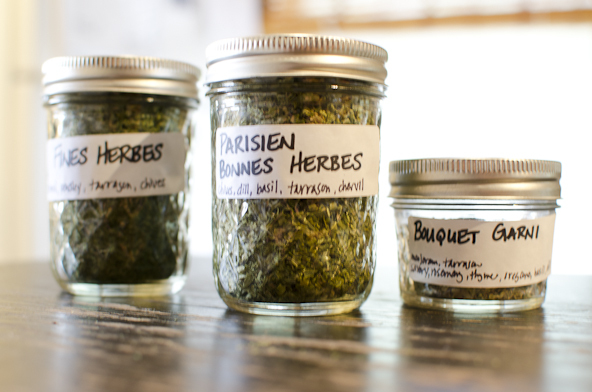 Fresh and dried herbs can usually be used interchangeably in recipes, but the flavor will be slightly different. 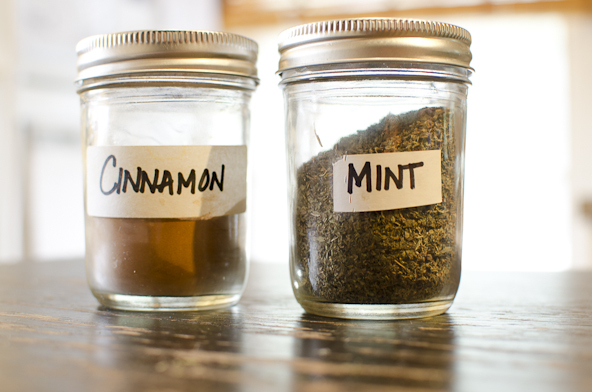 Here are a few tips to get the most flavor from herbs, whether you’re going for the convenience of dried or the bright ping! of flavor from fresh. When using dried herbs or herb blends, measure the amount you want to use, then crush the leaves between your fingers to release their flavor. 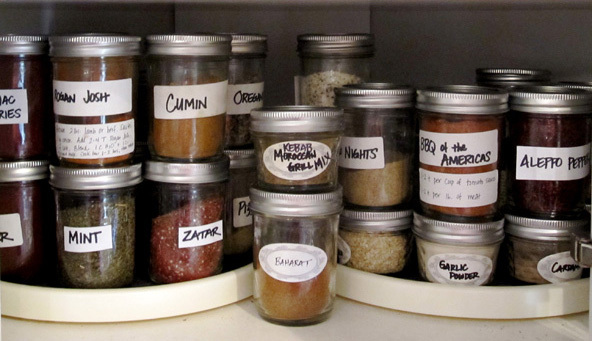 Your herb/spice organization system is amazing. Love. In the spirit of zucchini noodles, I made SQUASH noodles (ground beef, onion and roasted grape tomatoes) with Penzey’s Northwoods Fire seasoning last night. So very awesome. Thanks for the inspiration. I’m starting the AIP January 1, so you better believe I’m following all your updates with rapt attention. Thank you so much! I don’t know why spices confuse me but they do. Planning a trip to Penzey’s tomorrow. Alone of course because that way I can take my time and smell them all. Mmmmm spices! Great collection of info and inspiration. On your guidance from Well Fed I made my first purchase from Penzey’s a few months ago – lovely stuff. Zatar is my new favorite! Thank you Melissa, this is crazy helpful and so inspiring. BTW, I think cardamom might be one of the more interesting spices ever, because like cinnamon and nutmeg- it can be savory and sweet!! I love the flavor!! Nevermind…I just checked your link and saw cumin in the dreaded “NO” pile. I’ll have to be a cumin rebel! I am currently obsessed with Ras El Hanout. I’m putting it on everything like salt. Great list. I also love Penzey’s Tuscan Sunset in the Italian genre, and their Tsardust Memories is absolutely killer for beef or lamb. One of my new faves, though is their newish Ruth Ann’s Muskego Ave Chicken & Fish Seasoning. I’m using that CONSTANTLY on veggies. In other words, I’m hopelessly addicted to Penzey’s, and would throw a huge temper tantrum if I couldn’t get my spice fix. Awesome post! I have been doing the AIP for awhile now but haven’t made up any spice blends yet. These look yummy! I just learned there is a Penzeys about an hour from where I live and I really really really want to get myself in there and smell spices!! I recently discovered your Velvety Squash and Ras el Hanout spice blend–a-maz-ing. I made roasted Delicata squash seeds with Ras el Hanout. Also amazing. I made personalized Ras el Hanout blends for a couple of friends. They were amazed. In case you want to add some more flavor to your autoimmune protocol, I have just discovered all the different smoked sea salts in the bulk health food section of the store. Chardonnay, Applewood, Mesquite, etc. I have been putting them in my burgers and roasts. Don’t miss the black pepper at all!! I have learned so much about herbs and spices from you, thank you for opening up a whole new world of flavors for me and my kitchen!!! Well Fed has been my go to for new flavors and this handy guide will be printed out as well…I LOVE Penzey’s too and have most of those blends you mentioned! I’m really digging Sunny Paris right now too! Any recommendation on good spice/herb brands? I have been getting mine at Trader Joe’s but not sure they are the best quality. 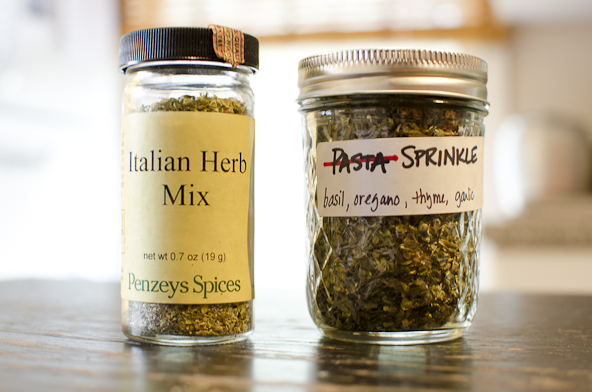 Another spice … errr … herb trick is to mix dried herbs with a small amount of water then microwave them for 40 seconds. This breaks the cell walls and really releases some of the volatile flavor compounds. Obviously this works best in applications where soggy herbs are okay. We do this for our pizza sauce at work. Also some herb and spice flavors are better carried by water, some by fats, and some by alcohol. I have that information somewhere and will pass it on next time I see it. Omg I’m a slave to ras el hanout! What is the difference between a place like penzy’s spices and the spices that you can buy in the store like spice world? Is the quality different? I’m thinking about taking a 2.5 hour trip to ATL for penzy’s and I’m wondering if it’s any different from the stuff I can get at Publix. Thanks!! I think the spices at Penzeys are much fresher and of higher quality than anything I can get at the grocery store. Plus, they have some wonderful spice blends that use their custom recipes. If you like cooking and a visit to a spice shop would be fun for you, it’s totally worth it. Consider me sold…to ATL I go. Are they also much more expensive?